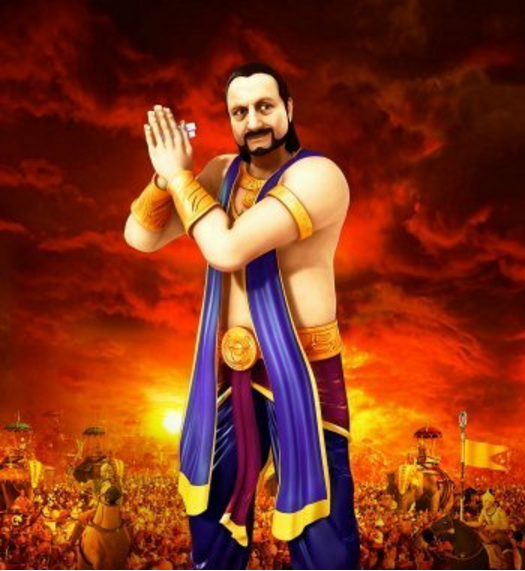 ~~GuRu bHaI~~: Shakuni, the Real Hero of Mahabharata! Shakuni, the Real Hero of Mahabharata! Regardless of the versions of Mahabharatha, the only Character or personality I admire in the humongous mythological epic is Shakuni. The entire epic is a brainchild of this witty Gentleman. Although, Mahabharata was a war of siblings which led to the sacrifice of plenty of lives in Kurukshetra, essentially, it was a battle of strategies between Shakuni & Krishna. Both of them had played their cards in such a way to design the destiny of the epic. They have cautiously inscribed the every segment of the epic with their ingenious directions to their respective cadres. Eventually, as Krishna was a God down to earth in that generation, he was thoroughly appreciated as the mastermind of the victory of Pandavas which was reasonably untrue. He was indeed the strategic advisor of Pandavas throughout the war since its infancy with an objective that Pandavas to win the biggest mythological battle. But, his counterpart, Shakuni was surprisingly having the same objective with a different dimension that the dynasty of Kauravas should be destroyed. Incidentally, he was playing the role of betrayal to his own cadre by creating a false faith on him with his wicked & sly nature which is strategically impeccable. Lord Krishna was equally crafty in his moves to take his folks towards the journey of victory. Surprisingly, both of these masterminds had the same objective and the rest of the people who had been involved in the epic were singing to the tunes of these two inadvertently. Hence, it was actually a one sided game with planned plots throughout inclined towards one team. Kauravas were thoroughly deceived by both the strategic decision makers. According to one of the anecdotes of this historic epic, Shakuni was taking a revenge to demolish the dynasty of Kauravas. Here goes the story of conspiracy behind Shakuni's revenge towards the Kaurava clan. Shakuni was actually Ghandhari's beloved brother. As per the astrological sign of Ghandhari, it was told that her first husband would die immediately after marrying her. So, she was married to a Goat and it was killed after the ceremony. This was a secret known only to Ghandhari's family which comprised totally 100 sons and she was the only daughter of King Subala, their dad. Later on, King Subala got her married to Dhritharashtra who was visually challenged since birth yet king of Hastinapur, one of the powerful kingdom of the era. As her husband was blind, Ghandhari had intentionally blindfolded herself to ensure that she should not see the world which her Husband couldn't see. Eventually, Dhritharashtra got to know about the secret of Ghandhari's first marriage and her astrological signs. He got pissed off as he was deceived with this fact. He had imprisoned everyone in Ghandhari's family including King Subala. Subala and his hundred sons were tortured and were poorly fed in the prison. They were slowly dying due to inadequate food and sanitation. Shakuni was the youngest of his hundred sons and wittiest also. Subala and his sons started feeding their food to Shakuni so that eventually he could at least survive. Subala had requested Dhritharashtra to free Shakuni alone out to ensure his clan survives. Dhritharashtra agreed after Ghandhari's request and finally freed Shakuni out of his prison. By the time, all of Shakuni's siblings expired and Subala was fighting with his last breath. Subala had asked Shakuni to take the revenge for Dhritharashtra's horrible act by demolishing his clan completely. Shakuni had taken his dad's words in the death bed and had made them as the mission his life. It was also told that Subala had asked to use his thigh bone to make a magical dice which could be used to engender the most massive war of the era. He had told Shakuni that whatever he wish, the dice would display accordingly. It was the superpower given by Subala to Shakuni to facilitate his mission of declining Dhritharashtra's kinship. So, it was the driving factor behind Shakuni's story of revenge towards Kauravas as per the above storyline. The absolute inference from the above finding substantiates my admiration of considering Shakuni as the Hero of the greatest mythological battle. I have recently read in an article that Krishna's strategies used in Mahabharatha are being discussed as case studies in few top business schools of the world. I would strongly recommend the strategies of Shakuni should also be studied to get a wholistic abundance of thought process behind the best strategies and tactics being used in the story of the biggest Indian battle. If there wouldn't be Shakuni, there wouldn't be a decline for Kauravas! If there wouldn't be Shakuni, there wouldn't be triumphant Pandavas! If there wouldn't be Shakuni, there wouldn't be appreciation bows to Lord Krishna! If there wouldn't be Shakuni, there wouldn't be 'BhagavathGeetha'! If there wouldn't be Shakuni, there wouldn't be an epic called 'Mahabharata'! Hence, I sincerely admire the real game changer, 'Shakuni Mamaji' out of plenty of characters of the epic because of his numerous instances of plots which were intentionally laid to ensure Krishna wins! A letter to #AwardWapsi cadre!